Kiki came into us a stray in a very sorry state, painfully thin and desperate for food. It was clear she had hyperthyroidism so we got her to the vet and on medication straight away. A few months down the line and she is now back to a normal weight and very happy. We think she is about 10 so will be rehomed under our 'Golden Oldie Scheme' under which we will pay for her daily medication, which goes on her food. Kiki has obviously been loved by someone in the past - she is very sweet and loves sitting on a knee having a cuddle. She likes nothing more than a long chat - always answering with a double or triple meow! 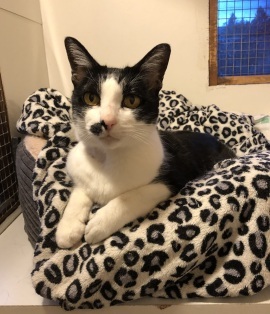 Kiki deserves a loving family to spend the rest of her days with and she will give a lot of love and affection in return - always getting the final word in every conversation of course!